It’s easy to associate drug and alcohol use with social activity. From dinner parties to holiday events, job promotions to a night out, it’s common for many people to use some type of substance to have fun, reduce stress, and fit in. For someone who’s recovering from addiction, getting together with friends and family might seem like a minefield, filled with constant triggers that make maintaining sobriety more difficult. But this doesn’t always have to be the case. People who suffer from addiction frequently have negative interpersonal experiences that are hard to let go. Consequently, they may opt to not engage with people, not know how to engage, or fear the results of getting too close to anyone. However, evolving research reinforces the importance of meaningful connections for overall health. Science Daily released findings from a 2017 study that concluded that dopamine is a crucial factor in human bonding. Dopamine is a chemical that prompts our brains’ pleasure and reward center. The study indicates “social affiliation is a potent stimulator of dopamine.” The researchers purport that a positive social network, in which all members give care and receive care, may potentially increase levels of dopamine. Harvard Women’s Health Watch reports that in addition to providing pleasure, nurturing social connections influence a variety of health factors over the long term as much as healthy eating and ample sleep. The most obvious result of positive relationships is reduced stress, including the biological release of hormones that prompt a calming, nurturing response. The research indicates improved function of immune, cardiovascular, and digestive systems as well. Other studies point to compelling evidence for how quality relationships reinforce physical, mental, and emotional health. Regardless of age, who we hang out with may positively or negatively influence our behavior. For example, if we feel connected to individuals who like long bike rides on sunny afternoons followed by dinner and topical conversation on a restaurant patio, we’ll have a different psychological and physiological response than if we sat in a darkened bar surrounded by people who complain about their lives while they consume alcohol until late into the night. Strong social ties provide an integral support system. Too often, many people in recovery feel isolated, afraid, shameful, and conflicted. When you establish a network of compassionate individuals, you’re creating a recovery community. If you form a recovery community within the first weeks after treatment, you’ll have a stable foundation from which to build your comfort and ease in social situations. 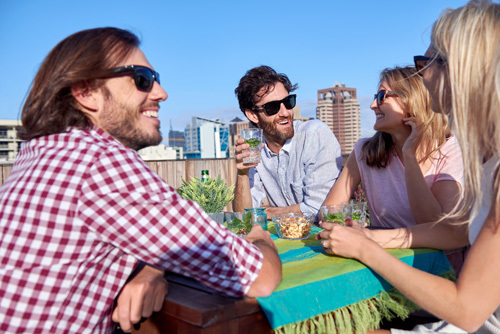 Whether it’s trying to fit in at neighborhood barbecue or looking for different activities away from negative influences, you have a lot of options for maintaining sobriety and creating stronger social bonds. Choose friends and family who support your wellness journey. This way, you won’t have to explain or defend your actions for any reason. Anyone who tries to persuade you, even with a “Come on! What’s the big deal?” doesn’t deserve an explanation. A simple “no thank you” is enough—their perception of you isn’t your concern. Hold a non-alcoholic drink. This psychological mechanism enables you to keep a literal hold on something and also dissuades constant inquiries as to whether you need a drink from the bar. Work the event. If you’re staying busy and engaged, you’ll think less about the “don’ts” and “can’ts” and more about how you’re in control of yourself. So assume the role of a party photographer, or act as the scorekeeper for games, or be helpful as a member of the clean-up crew. Call the host ahead of time. Whenever you feel like a particular environment or group of people might activate certain triggers, contact the host and let he or she know your circumstances and why you might make an appearance but need to leave early. Explore different types of activities. A change of scenery, a set of new faces, and a chance to be curious and open—these factors are all available to you if you seek out alternative ways to have fun. Ask someone to a movie or lecture. The ability to be present with another person while enjoying the film or a speaker is an easy way to enjoy his or her company without the use of drugs or alcohol. Afterward, arrange to talk about event over a cup of tea for about 30 minutes. This helps you engage socially without pressure to talk about anything else. Volunteer. When you share a similar purpose with others, you’re involved in a circular exchange of caring. And you’re staying active. Volunteerism provides a number of benefits, including emotional stability, a greater sense of worth, a stronger social network, and improved outlook on life. Finally, make sure to pause for a few moments when you return home to reflect. Consider how you felt going out, who you met, what you did, and how you feel afterward. More importantly, acknowledge that you’ve just experienced another crucial aspect of your journey, and why this matters to you. To effectively socialize while in recovery, be mindful of your commitment to wellness and reinforce your social circle with like-minded individuals and activities to stay true to your goals. To learn more about Twin Lakes addiction rehab treatments near Atlanta, please use the convenient contact form. Psychology Today: Having Social Bonds Is the No. 1 Way to Optimize Your Health. English Mountain: Staying Sober (and Enjoying Your Social Life!) in Recovery. Johann Hari’s TED talk: Everything You Think You Know About Addiction is Wrong.